Size: Can be customized to fit any ages. All you have to do is check your gauge and cast on the right amount of stitches you need. The follow the rest of the pattern. 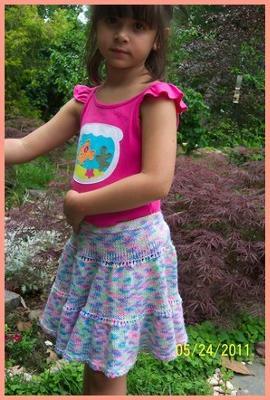 This is the first skirt I designed for my daughters when they were two. They are five now and skirt still fits them but it's getting a bit shorter. Suwan, is my older twin girl. She happily volunteered to wear her skirt and to post for me here. This skirt has traveled all over the country with us on our cross country trip last year! 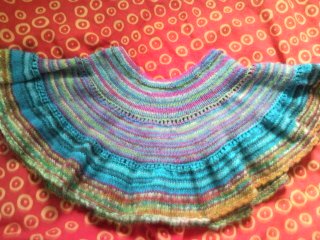 The skirt is knitted in round using circular knitting needles. 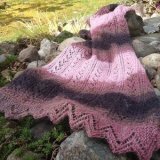 It knitted in 3 tier levels. The second tier has twice as many stitches as the first tier, and the third has twice as many stitches as the second. The edge of the skirt is composed of chain crochet and single crochet. I blocked the skirt on a towel on my carpet floor. The skirt looked like a big circle with a hole in the middle. This is one of my favorite skirt because I like the way it hang on the body. Finished Measurement: waist size = 20 inches, skirt length = 12 inches. - 150 g (about 5 oz) of 3 ply-worsted weigh yarn or light worsted weight yarn of your choice. Waist Band : With the shorter needle cast on 100 stitches. (Increase cast on by 5 sts to add an extra inch to the waist line.) Place marker and join the yarn make sure not to twist it. Row 34: (Increase tier 2): Change to the longer needle. *yf, k1, repeat from * to the end. Next Row (increase tier 3): *yf, K1, repeat from * to the end. Knit the next 25 rows, p 1 row. Bind off all stitches. Don't cut yarn. *Make 3 chains with the crochet hook and sc into the 3 rd st; repeat from * to the end. Cut yarn and weave the end to back of stitches. Cut 21 inches of elastic band and sew both ends together. Fold the first 5 rows of the skirt over to the wrong side to form a waist band. Place elastic band inside the seam and sew along the purl line using the left over yarn and a tapestry needle. I hope I didn't leave anything out. The skirt pattern is pretty much the same as the other toddler skirt except this one has 3 tiers instead of 2. Let me know if you have any questions. I'll be happy to answer. Oh, it is turning out so well! Thank you for explaining what it meant. After reading your reply, I went on YouTube to get a visual before I tried it. It looks really cute, with the little eyelet pattern. I have just begun the third tier. I have no idea how to read patterns, so this is my first time trying a pattern. Before, I stuck to scarves, blankets and simple hats in the round with no patterns. Thanks so much for posting this, and for being available to answer questions! You're welcome! I'm so glad you are exploring new areas of knitting. The skirt is fun to knit and it's simple. I used to make many of them for my girls when they were younger and they love wearing them everywhere. Good luck on you knitting and thank you for stopping by. 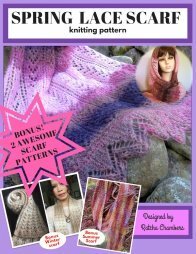 I am a novice knitter, so these are probably very simple questions about how to read the pattern. What does increase tier 2 and increase tier 3 mean? Also what does 'yf' or 'yo' mean? It can't just mean to bring the yarn front to purl it, or you would have just said to purl, right? Thanks so much for your help! Increase tier 2 and tier 3 are locations where the increases take place. You can ignore the word tier, when you see one and just look at the instruction. The "yf" and "yo" mean to bring the yarn to front or yarn over needle before you start to knit. When you knit a stitch with yf or yo, the yarn will go over the right needle and create an eyelet. This will gain an extra stitch. Does the yf mean move the yarn to the front like purling or does it mean you have to yarn over, you don't say how to move the yarn to the front. I am an accomplished knitter but this was confusing. Sorry, didn't mean to get everyone confused. I guess I'm an old fashion and like to use "yf" instead of "yo". Any way, you can ignor the "yf" and replace it with "yo" everytime you see it. Thank you for the question. So the pattern is to have a yarn over to add stitches to the skirt? Question: What does yf mean on the pattern? Answer: It mean to bring yarn in front of work. I'm not sure how to finish this skirt. I'm not a crocheter but am willing to give it a try. Could you explain how to make 3 chain and sc into the 3rd st. I'm not sure what this means. Sorry for keep you waiting. I'm so glad you're willing to give crochet a try. You're such a good sport! I guess the best way to explain this is by showing you how to do it. I have made a mini video on how to crochet the chain st edge. I hope it will help you accomplish your skirt. I'll be waiting to hear from you. My video die on me before I completely finished. I was going to tell you about the crochet hook. You can choose a hook that suggested on the yarn label. Or you can just watch it here. Question: How much sock yarn is required for the circular stockinette skirt? What size needles did you use? Answer: I'm sure you referred to this short skirt I posted in the gallery. I used circular needle size 6 (4mm) and I used almost 2 balls (50g) of sock yarn. I would like to make this summer skirt for a 10 year old. How will I adjust the number of stitches in order to fit her? Thanks for visiting and for the question. I'm glad you asked. I'm sure other knitters probably wonder the same thing. pattern the same way. Just cut out elastic waistband as long as you wanted. Is girl skirt only for toddlers? 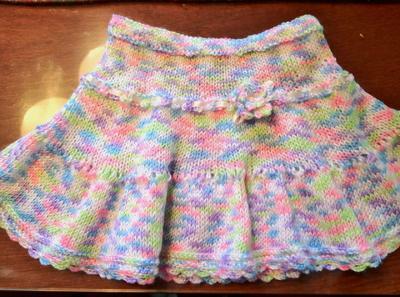 The pretty girl 3 tiered skirt (girl skirt in simple stockinette stitch did not list sizes. Is it only for toddlers? Answer: No, the girl skirt can be customized to fit any size you want. All you have to do is check your yarn gauge and cast on the number of stitches for the desired waist circumference. It was my typo! You're right the pattern should read the first 5 rows of the skirt. This sounds fun! I have some stash yarn that should work. The only glitch in your pattern is the waistband part should maybe read " first 5 rows of stitches"?